The System Performance Monitor component (PSPMSYSHEALTH; navigation: PeopleTools -> Performance Monitor -> System Performance) gives an overview of each system monitored by the PeopleSoft Performance Monitor. However, the poor performance of the view PSPMSESSIONS_VW can severely affect this component, to the extent that as transaction history builds up the component will not respond within the timeout. Below is an extract from a PeopleTools trace. What happened is that the query ran until the Tuxedo service timed out. Tuxedo terminated application server process 31944, and spawned a new process (ID 3598). The user session received an error. Even when each query finishes within a reasonable amount of time, the query can be run several times by the component. This is the definition of PSPMSESSIONS_VW delivered by PeopleSoft. Firstly, accurate object statistics are required on the transaction history table and its indexes. Finally, I have changed the view. The IN() operators have been changed to WHERE EXISTS(). The new index supports the efficient execution of these sub-queries. The sub-queries are now both correlated back to the main query on T3. The ROWNUM criteria have been added to restrict the number of rows the sub-queries can return. Your mileage may vary, but for me this made the difference between the component being usable and not. 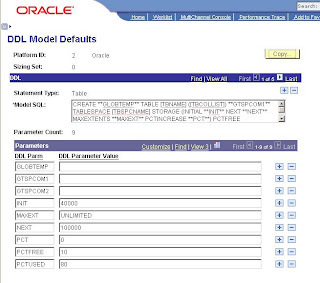 In PeopleSoft for the Oracle DBA Chapter 8 (p168-170) in a section called Sequence Numbers and Concurrency I discuss the implications of how this is done in HR8.4 as a part of the save time processing in PeopleCode FUNCLIB_HR.EMPLID.FieldFormula. The problem is that while this update remains uncommitted, nobody else can obtain a new employee ID because the row is locked. This design has scalability issues. PeopleSoft applications generally get away with this because the update is performed as a part of save time processing which is committed when that is complete. Thus the lock is held for only a short time, and never waits for a human response. It executes in the application server which should be close to the database, so there is no network latency. However, I was looking at this same PeopleCode in HR9.0 and I have noticed that is has changed. The change appears to have been introduced in HR8.8, and uses a new built-in PeopleCode function, GetNextNumberWithGapsCommit(record.field, max_number, increment [, WHERE_Clause, paramlist]), that was introduced in PeopleTools 8.44. "Use the GetNextNumberWithGapsCommit function to return the sequence number value plus increment for the given field residing in the given record. This function also enables you to specify a SQL Where clause as part of the function for maintaining multiple sequence numbers in a single record. This function is typically used for obtaining a new sequence number for the application ... The sequence number (record.field ) is incremented right away and it doesn't hold any database internal row lock beyond the execution of this function. The function is enabled for Application Engine programs running in stand-alone mode (via PSAE). This function is disabled for Application Engine programs that execute through the PeopleSoft Application Engine server (PSAESRV). This function is enabled for PeopleSoft Application Engine programs running under Unix System Services on z/OS. PeopleSoft does not recommend Using both the GetNextNumberWithGapsCommit function and the GetNextNumber function in the same application, on the same table, in the same unit of work. This can lead to lock contention or deadlocking. For a DB2 z/OS database, isolate the table that contains the sequence number to its own tablespace and set the locksize parameter to row." Hence, if migrating data into a system via a Component Interface (eg. employees from a legacy system where new EMPLIDs will be allocated), and you need to do this with multiple concurrent process to achieve throughput, it is advantageous to use PSAE rather than PSAESRV processes, otherwise they are likely to serialise. This is the PeopleTools trace produced when I added an new person to an HR system. You can see the second connection to the database is created at line 51935, and then the row is updated, queried and immediately committed. The lock is only held for only 35ms (on my laptop), instead of holding it until all the save-time processing completes. This approach is certainly an improvement over the previous behaviour. It is similar to an Oracle Sequence without any caching which increments a value stored on SYS.SEQ$ in an autonomous transaction which it immediately commits without affecting the main transaction (except that Oracle does this in the same session, and here PeopleSoft have created a separate session). Also, like an Oracle sequence, if the main transaction fails you are left with a gap in your numbers. Some of the dictionary definitions of the word sequence imply a fixed increment or decrement between values (usually 1). In some ways, it would be more helpful to think of this a way of generating a unique identifier rather than a sequence number. By looking at v$session you can see that a second session is created for the same client process. The DbFlags field in the Application Server and Process Scheduler parameter filess controls how PSAPPSRV and PSAE in creates and terminates the secondary session. By default, the second session persists until the PSAPPSRV session terminates when either the application server is shut down or the PSAPPSRV process recycles when the number of services reaches the recycle_count specified in the application server configuration file. Obviously, disabling the second database connection would effectively negate the advantages of this new functionality. There is additional overhead to the second connection, and if DbFlags is set to 8 the secondary session would be shut down after the incremented sequence number has been returned. However, in a large, highly active system, where sequence numbers are requested frequently, this would lead to frequent creation of secondary sessions. The process of allocating new sequence numbers would also have to wait for the new session to be created. Note, CLIENT_INFO is not set in the secondary session. However, it is possible to copy the CLIENT_INFO from the primary session using an ON LOGON trigger (which can also be dowloaded from the Go-Faster website). The result is that when the second session is created the trigger fires and copies the client info from the first session and appends the string ',Second'. I would like to draw attention to the risk of uncritically accepting performance information from either a tool or an instrumented program. It is always necessary to consider whether you can believe what you are being told, or whether something is lying to you. In this case, I want to highlight in the Application Engine Timings report. Take the following example from Time and Labor. The AE Timings report claims that the process spends 91.5% of the execution time in SQL. This would lead you to believe that this process is affected by the performance of the SQL, and that you need to do some SQL performance tuning. However, all is not quite as it appears. 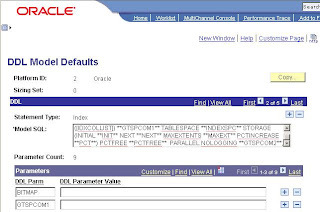 Faced with a potential SQL problem, I usually turn to Oracle SQL Trace. The following is taken from a TKPROF analysis of the trace file for the same process. The database reports 849.98s for the idle event SQL*Net message from client, and only 470.93s on non-idle activity. So only 36% of the total elapsed time is spent in the database, the other 64% is time that the Application Engine process is busy executing code. This is certainly a very chatty process. There are nearly 200,000 round-trip SQL*net messages between AE and Oracle. It could be a network latency problem. However, very little time is spent on the SQL*Net more data events so it is unlikely that there is a significant network component. Let's look at the statements that have the longest times in AE timing report . In less than 24 minutes, some statement have been executed very frequently. So, there were lots of SQL*Net messages, because there were lots of SQL statements. These SQL statements are submitted from PeopleCode. It is very likely we are in some sort of procedural loop, and therein lies the problem. PeopleSoft programs can only measure the time taken to execute SQL from the perspective of the client program. In this case the timings are calculated by instrumentation inside Application Engine and PeopleCode. Meanwhile, the timings in the Oracle trace are obtained from instrumentation within the Oracle kernel. There is still a fair amount of code in PeopleSoft that executes during the time counted as execution of SQL Statements. This is not just the SQL*Net libraries. I think that the timings include most of the time it takes for sqlexec() and Row set functions to execute. The discrepancy with the Oracle time mounts with every SQL operation. In this case, there is very little to be gained by tuning the SQL. We can't do much about the PeopleCode because it is delivered vanilla functionality. All we can do is to bring more CPU to bear upon the problem by running multiple concurrent instances of the process. PeopleSoft Temporary Records are used for working storage during Application Engine programs. Typically, AE programs truncate and repopulate the tables before using them. PeopleSoft recognised the need to keep the statistics on these tables in line with the data that they contain, and so used the %UpdateStats macro in many places in delivered programs to update the statistics. However, frequently gathering statistics on even small tables can become time consuming. Recently, I have been working on PeopleSoft Time and Labor. This makes heavy use of temporary records. In a single execution of TL_TIMEADMIN, several tables associated with temporary records are truncated, repopulated and analyzed many times. I discussed the problem with excessive use of truncate elsewhere giving rise to Local Write Wait. Oracle also recognised this problem, and in version 9 of the database they introduced Optimizer Dynamic Sampling, where the database samples the data to generate statistics at statement parse time. Locking optimizer statistics to prevents the %UpdateStats macro from putting them back on. Tables with locked statistics are also omitted by GATHER_SCHEMA_STATS and GATHER_DATABASE_STATS (unless the force option is specified) and hence also by the delivered maintenance window job to refresh stale statistics. The final piece of the puzzle has been to set OPTIMIZER_DYNAMIC_SAMPLING to 4 at instance level. I certainly have had problems with this parameter set to the default of 2. The dynamic sampling levels are described in the Performance Tuning Guide 14.5.6.4. Level 3: As Level 2, plus all tables for which standard selectivity estimation used a guess for some predicate that is a potential dynamic sampling predicate. Level 4: As Level 3, plus all tables that have single-table predicates that reference 2 or more columns. So the next stage is to identify working storage records and their associated tables. I started off looking for tables that had recently been analysed. The following script identifies all instances of temporary tables associated with temporary records, and then deletes and locks the statistics. I started by restricting it to list of specific tables, but I think it would be perfectly reasonable to take this approach with all temporary records. DDL model wrapper script accordingly.